Its was a great day for diving, as we continued our new tradition that began last year with a 4th of July Weekend Dive on the Bottom Time. The Bottom Time is a great dive boat out of the 6th Street Marina in Barnegat Light. This boat has one of the best crews around. 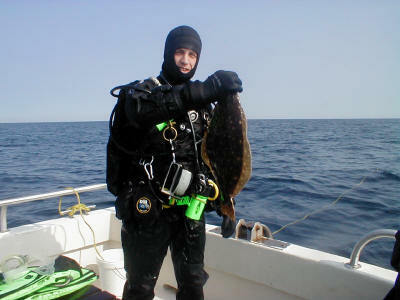 George and Roger are great divers and very knowledgeable individuals. We arrived at the dock around 6:00am all ready to get in the ocean. The divers for this trip were Kris Centrone, Arin Centrone, Mike Grassmann, and Ed Johnson. Also on board was the Great White Hunter Dave Oldham. It was great, all divers were there early and the boat got underway 20 minutes early. We were scheduled to dive the San Saba, but a few days earlier the crew of the boat and Dave killed every living sea creature within 3 square miles so we decided to go to another site. The choices presented were the Great Issac and the Vizcaya. After a few coin tosses (which you couldn’t read heads or tales it was so rusty) and a few opinions tossed out a decision was made. The Vizcaya (Arin’s white whale) came out the winner. We arrived at the site about 10 miles offshore around 8:00am. The crew tied the boat in and Mike and Dave splashed first. The next group over was Arin, Kris and Ed. Dave and Mike went on a little hunting safari while Ed, Kris, and Arin went and explored the site. The depth to the bottom was 83 feet at the boiler; bottom temperature was a brisk 46 degrees (I am not so sure brisk is the right term, damn cold entered my mind) and visibility was around 35 feet (not to shabby). We entered the water at 10:47am for the second dive in the same dive teams. Mike and Dave still continued their hunt , with great results, and the other three continued to explore this great wreck. We finished the dive and return back to the dock as extremely happy people, ready for a cold beer and a nice nap. The Vizcaya is a great wreck and there is more information on this wreck at this site including some photographs. The most noticeable feature is the 30-foot boiler and engine in the middle. It is a great navigation point for this wreck. This is a must dive for any Atlantic Diver.